On Wednesday, I joined what I expect was a pretty big online crowd for a Search Marketing Now webcast, Local Business Listings: Straight Talk With the Data Providers. It covered an important area of local search — a business owner’s listings with the companies that share data with major search engines, major local directories and city guides, Internet yellow pages, and other sites. It was a good webcast overall, but one point left me frustrated. You can listen/watch online now if you missed the webcast, but I’m going to recap the primary points here, too. Pankaj Mathur of InfoUSA was up first with some background. InfoUSA manages 15 million business records and they phone validate every business in North America. They have 700 people compiling & correcting data and make more than 27 million phone calls per year. Pankaj encouraged business owners to claim their listings, which is common advice, but made a good point about commitment. He said that claiming a listing means you’re taking ownership of the data in perpetuity. It’s not like a New Year’s resolution that you work on for a little while and then forget. Once you claim a business listing, many search engines and data providers will stop relying on any other source for updates to your business; ergo, you have to commit to managing your data. He also made a point about the information you include in your business listing, specifically choosing categories and writing descriptions. While we often suggest to be as complete as possible in updating a business listing, he suggested that more isn’t always good — especially if the “more” you’re putting in your business listing is a bunch of low-ROI keywords and categories (like a restaurant optimizing for “french fries”). Go to InfoUSA.com and click on “Update My Listing” in the footer. You can update your business listing or add a business listing, but you cannot claim ownership of it. InfoUSA retains ownership of the listings in its system. They won’t make any changes you submit until they’ve validated the information by phone. Gib Olander of Localeze emphasized the need for businesses to NAP. 🙂 Not sleep (sadly), but to create a standard Name, Address, Phone for your business (NAP). This makes it easier for search engines to utilize your business information, and creates additional citations (which help with rankings). Gib’s suggestions include using appropriate keywords with your business listing for increased findability. He says 10% of all searches are a five-word query string; not “hotels chicago,” but “pet friendly hotels in chicago.” He suggests businesses identify all their listings and add/delete/merge as needed. Clean the data. Establish a consistent NAP – make sure your address is USPS certified. Choose a primary category, and when you have all this in place, submit to Localeze at localeze.com/manage. I liked what Gib said about business listings vs. web sites: He said your business listing is your primary online identity; it’s more important than your web site. Managing business listings can reduce your overall online marketing spend and improve conversion. 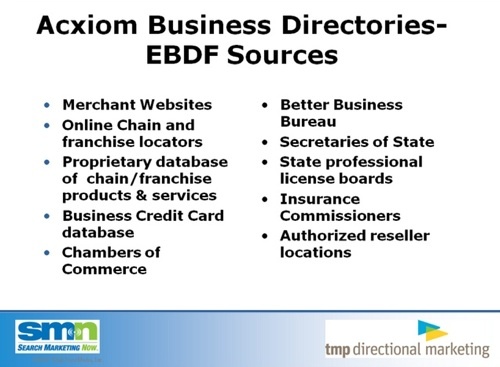 Jonathan Cohn of Acxiom started by explaining the company’s process for obtaining local business data: It includes data from white/yellow print directories, updates from telephone companies, national advertiser & merchant supplied files, and TeleAtlas latitude/longitude information. He also explained how Acxiom cleans its business data: Inactive records are deleted, addresses are cleaned by USPS standardization, Acxiom’s proprietary enhancement methods, area code correction, business name normalization (i.e., KFC vs Kentucky Fried Chicken), and latitude/longitude application. When classifying local business listings, Jon said Acxiom uses yellow page headings, advertiser inputs, keyword assignments (if biz name is “John’s Mexican Restaurant,” for example), and ancillary processing, including phone verification. Acxiom has a lot of information sources, too many to list, in fact. Here’s the slide Jon showed listing where Acxiom gets its business data. To get listed in Acxiom and other business database providers, be listed in the yellow pages (not a necessity, but if you are, it’ll get you in these databases), have a web site, participate with data aggregators like UniversalBusinessListings.org, and … this was one of the biggest pieces of news from the whole webcast … Acxiom will soon allow direct submission via databyAcxiom.com. That’s huge news because it’s been difficult for many small business owners to know where to go to add a listing to Acxiom’s database. Jon also added that, in the future, he thinks business info in social media settings will be important, and he expects unique info from customer reviews and such will grow in importance. Jon reiterated the need to regularly monitor your business data and make sure the name, address, etc., are always listed consistently. Gregg Stewart of TMP Directional Marketing moderated and added a few thoughts of his own. He emphasized that this isn’t about ad placement, it’s about data optimization; results take place over time. He said business owners need to participate with all data providers and monitor their progress over time. All of the speakers recognized that local business owners struggle with this idea of managing listings and where data comes from and how to fix bad data, etc. No one argues that this is a roadblock of sorts. But during the Q&A, when one person asked the data providers to reveal which search engines and web sites they each send data to, none of them could do so. All three list some of their partners online, but it’s not complete. No doubt this is a business decision and they feel the need to not fully show their hands to one another, but it sure doesn’t serve the local business owner at all. It would be tremendously helpful to know that infoUSA sends data to such-and-such web sites, and Localeze sends data to this group of web sites, and Acxiom sends data to these sites over here … but no luck. That part of the local business listings ecosystem will remain a mystery, and business owners will continue to wonder where the bad data they find online came from. Thank you for the article. i need to learn all of this before week launch our new website next week. I had a guy promise me to be on the first page of google… Now I’m just out a grand. Will try your suggestions and come here often for updates. Great summary! I too shared your frustration about search engines. I also didn’t really appreciate all the “work with your agency” if you have a problem cop outs. Besides that helpful to hear each company’s take. Great write up…I did a very brief recap over Gibs info on my blog. And I felt the same way about them dodging the listings question. My other question that I really was hoping would be addressed is if listing with the UBL is enough, or if you need to set up accounts with all of listings manually. I have heard back and forth on this issue…the best advice coming from Will Scott. I am running a few tests with the ubl to see what happens. Do you have any input? Thanks Matt for this great article. I just have a question similar to Mike. How is UBL listing any different from the ones you mentioned in your article? In other words, UniversalBusinessListing.org charges $30 to submit business data to infoUSA.com site. So the questions is, why can’t I do this directly at infoUSA website? One thing I find very frustrating about keeping my business address consistent across the different channels, is the fact that my address has a “suite” in it. Some put it on the same line as the street address and some add it as a second line, below the street address. As a result, I find duplicate listing in many places that only differ by the way “suite” is denoted. All other info is the same. Does anyone have any suggestions on how to “standardize” this suite listing issue. Any preferred methods? Regarding UBL questions. Actually we charge $30 per year to make sure that you are listed everywhere you need to be listed; accurately across all major search engines, online yellow pages, 411 directory assistance, social networks, mobile phones, and GPS navigation devices. Absolutely you can yourself submit to all the various aggregators and SEs but is it really worth the countless hours of effort & frustration discussed here. Also infoUSA, Acxiom, etc. do not have error correction and reporting like we do. All you can do is submit & hope. I like that the data providers are able to provide verified listing data directly to search engines. The Internet needs to stamp out the SEO Spammers who get their mass linked “spam Listings” to show up in the local search results. It seems that the “verified” data providers will help to provide search engines to clean up the local search frenzy. As a local business marketer I welcome the standardization that they bring. As for which ones submit to which sites… That’s the secret! I’d sure like to get that information. Another question. When submitting data InfoUSA directly they don’t allow you to submit enhanced listing information (hours, products, brands, payment methods, etc…) Is there an advantage to submitting through a source like UBL who is taking that enhanced data and submitting it to infoUSA? What about localeze, do they take enhanced data directly? Some of the places UBL says business information is sent to make no sense, like “Apple” and “Disney”. Some of the places are actual marketing companies, which concerns me because the FAQ says “We will not share this information directly with marketers or non-directory entities”. Some of the places no longer exist or are out of date, like The Red Book. Also, UBL.org does submit to Localeze (according to their own list). That’s key information small business owners probably don’t know. I created a step by step process on my blog to list your business with Acxiom – http://www.milkmen.com/blog/2011/11/how-to-guide-for-acxiom/ This will work even for new businesses. You don’t need to go to ubl.org and pay those fees. Sorry UBL. As long as you have registered your business with your State and have an EIN (employer identification number) my post will walk you through it. Nice find, Cody! Thx for the comment, too. I’ll do a blog post pointing over to you so that more people are aware of this. Thanks again for the post! I posted new records for visits, page views, time on site, etc… I really appreciate you article!